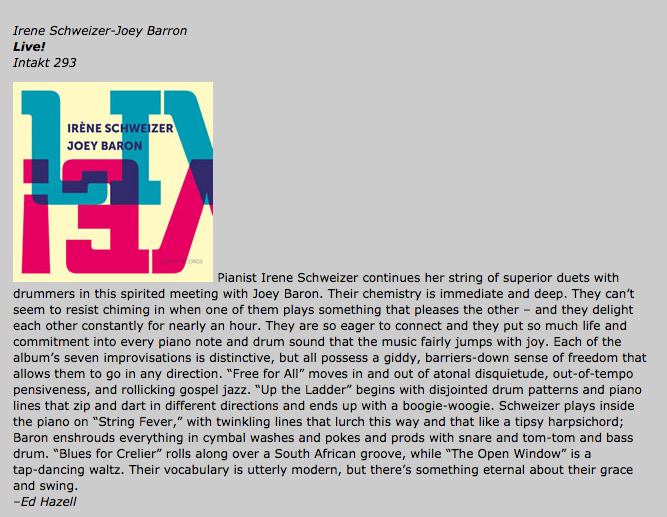 On a placid day in late July, the pianist Irène Schweizer combs through her modest Zurich apartment, determined to find something — a bootleg. It's of a concert she gave in 1960, when she was nineteen, with a septet of fellow Swiss musicians who brazenly called themselves the Modern Jazz Preachers. When she finally finds it, she pops it in and listens to herself play "Lullaby of Birdland," swinging and lyrical. 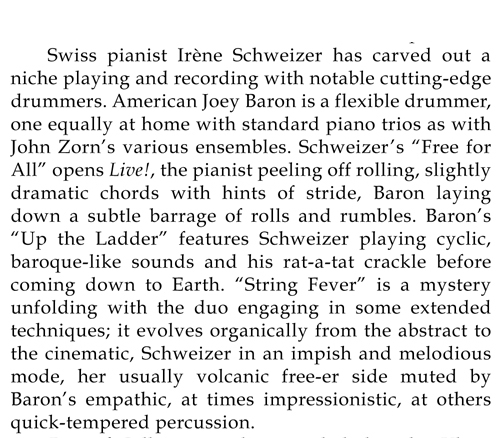 It's not what you immediately associate with Schweizer, who has long been associated with free jazz, especially in Europe, where she was part of the Berlin collective Free Music Production that began in 1968. "I played the whole history of jazz," she says, "but now everyone thinks I can only play free jazz, and then when they hear the blues, they think, 'Oh, what is she doing now?' They can't understand it, but this is my background. 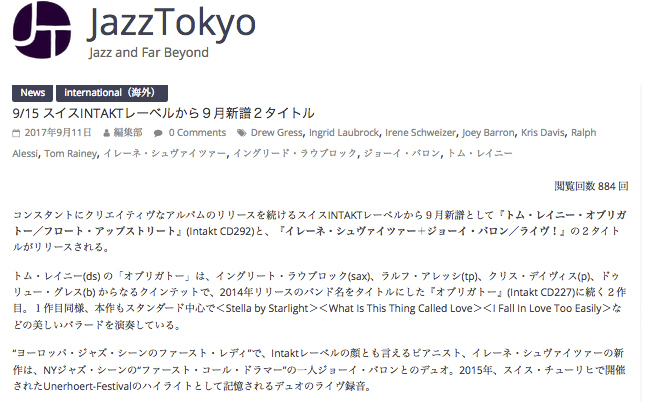 If jazz music never existed, I wouldn't be a musician." 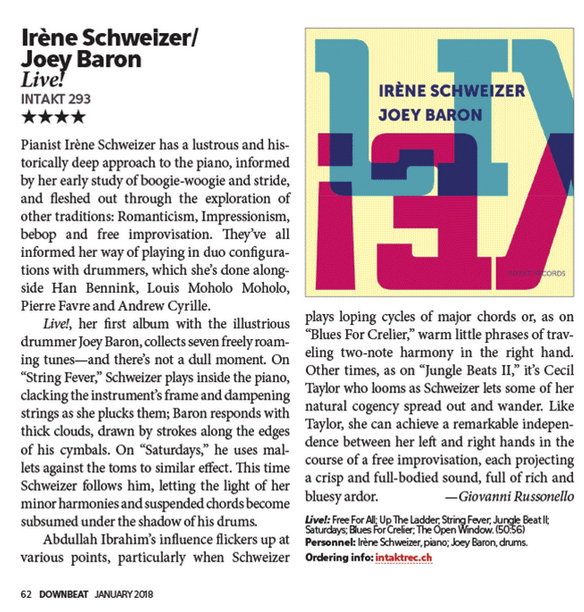 Her dozens of recordings — most of them on Zurich's phenomenal Intakt label, on whose board she resided until last year — make clear just how much she venerates the jazz tradition. In the midst of wide-ranging improvisations, you'll catch flashes of the past, expertly deployed. Sometimes short flourishes will display the grounded rhythms of pre-war stylings like ragtime, boogie-woogie, or swing, but she's just as likely to pound out block chords in the manner of McCoy Tyner or the delicate melodic flourishes of a Satie miniature. 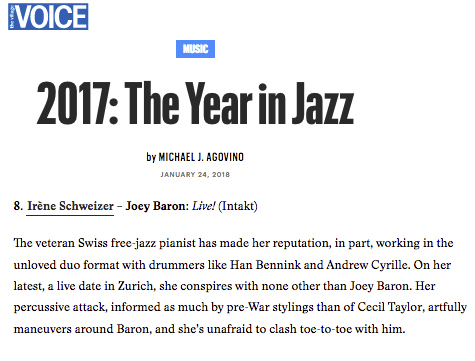 The 76-year-old Schweizer, who in person projects warmth and self-effacement, even shyness, entered the jazz world in the early 1960s with three or four strikes against her: She veered, thanks to the influence first of Paul Bley and then of Cecil Taylor, into free jazz (polarizing at best, reviled at worst); she was a woman in one of the most male-dominated artistic arenas; she was a lesbian, something she was always open about; and she was from Switzerland (her last name literally means "Swiss"), a tough sell considering that the country, especially at the time, didn't exactly strike up images of cool hard-boppers. Originally from Schaffhausen, north of Zurich, along the Rhine in the relative flatland near the German border, she took a steep, untraveled road, and just remained on it for more than fifty years. "It's true," says Schweizer of her journey. "I didn't realize that: I'm a woman, and the only one." 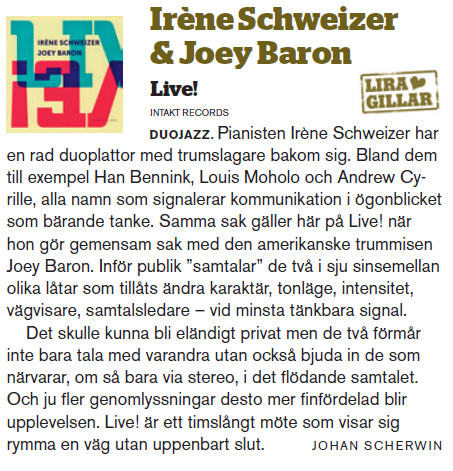 Schweizer's single-minded artistic vision is apparent on her brand-new album, Live!, an improvised duo performance with New York–based drummer Joey Baron recorded two years ago at Rote Fabrik, Zurich's alternative art space born out of the early-1980s student riots. Featuring a dynamic attack that can be ferocious and distinctly percussive (she plays drums herself, though not publicly anymore), then nimble and searching, it's a testament to the subtle traditionalism that's always lurked on the margins of her playing. 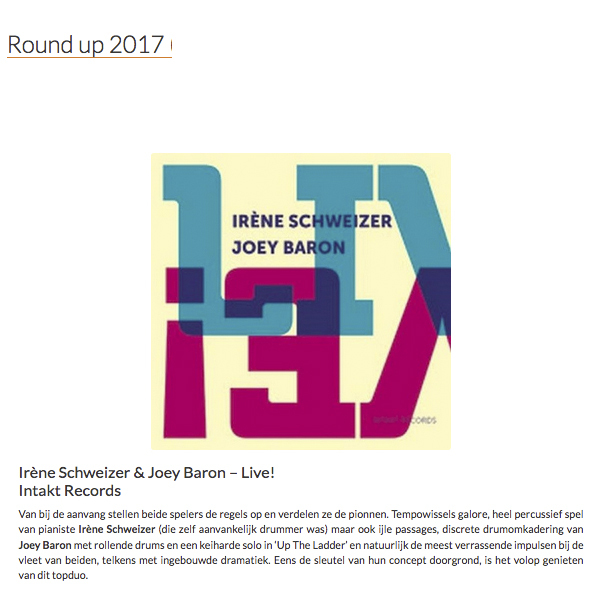 "I think the influence of real jazz tradition is very strong in Irene," says Patrik Landolt, the founder and head of Intakt, in the label's office across town in an industrial quarter. "She had an era of free playing, of emancipation, and today she's so free she can combine both." Landolt started Intakt in 1986, in part to give Schweizer a platform since, he says, "Irene was completely underdocumented." 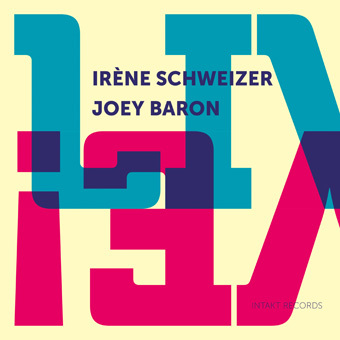 The label's first record was Irène Schweizer Live at Taktlos, a Swiss festival she helped organize. The date included George Lewis, Paul Lovens, Günter Sommer, Maggie Nichols, and Joëlle Léandre, the latter two part of her semi-regular, all-female Dada-esqe trio, Les Diaboliques, which started back in the 1970s. When Landolt proudly pulls the original vinyl version from a shelf, he notes how the opening is on the wrong side. "We didn't know how to do a record," he says, laughing. For this recording, she adds to her ongoing partnerships with drummers. 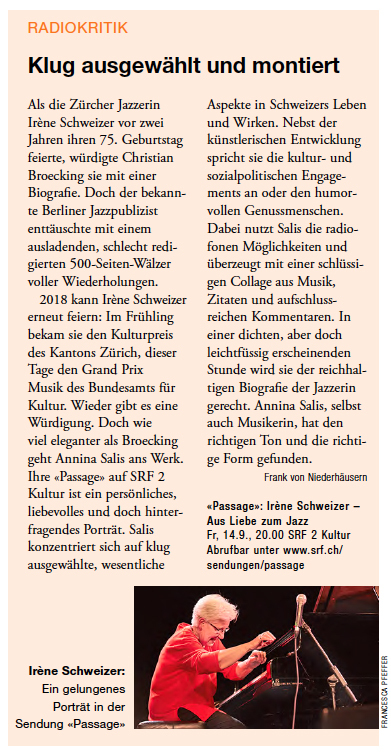 (She's previously recorded with Günter Sommer, Pierre Favre, Han Bennink, Andrew Cyrille, and Louis Moholo, who she first met in 1963 when he and other South African musicians, Abdullah Ibrahim included, lived in exile in Zurich.) 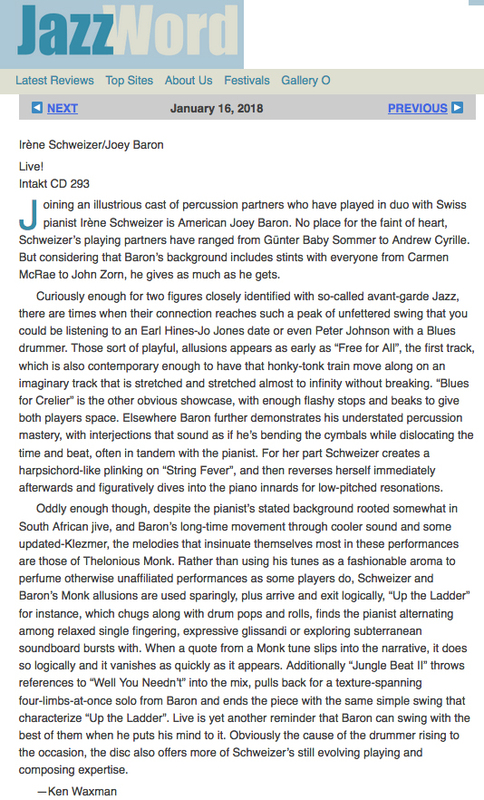 This time she chose to collaborate with Baron, the longtime associate of John Zorn. 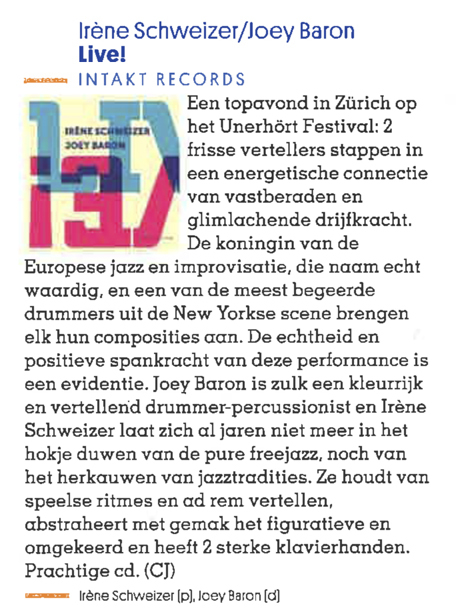 They knew each other loosely through the free-jazz scene over the years, but she hadn't seen him play live solo until early in 2015, at a small festival for improvised music in Biel, Switzerland. "He played 45 minutes," says Schweizer from behind royal-blue-rimmed eyeglasses, "and I never heard such a nice concert. It was so great, and there were some people in the audience who knew me and they said, 'Irène, this is the drummer you have to play with and do a CD with.' I said, 'Of course, I feel that.' "
When she approached him, Baron says by phone from Berlin, "It was a big yes. Irène is a legend, and she is a very important figure and I absolutely respect her, a lot. Who wouldn't be flattered.… And she's a very, very kind, wonderful human being, and that's very important to me. And that's not always the case." Given the often lonely path she's traveled as a rare woman in jazz, it's impossible to ignore the challenges she's faced, which continue to this day. 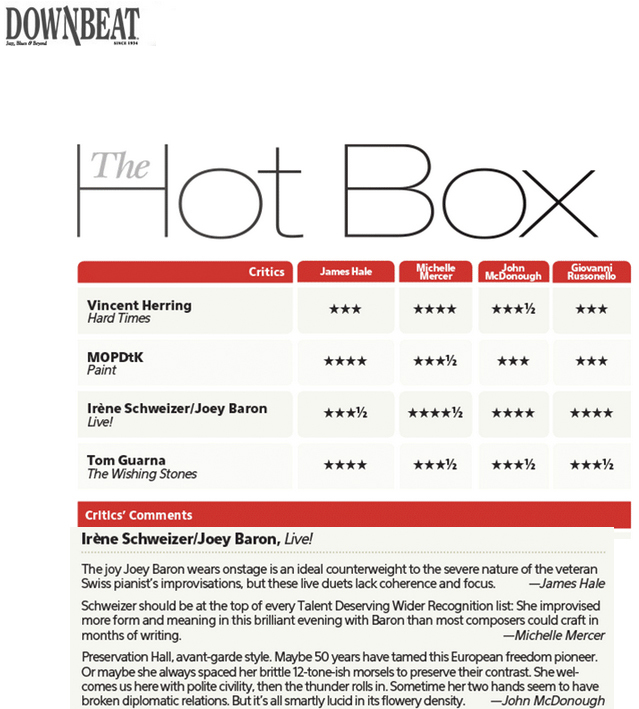 "The audiences love her, but not the business," says Landolt of Schweizer's limited recognition in New York. "The club owners don't invite her. She never played the Blue Note, never the Vanguard, never the Jazz Standard." When asked if she felt shut out in any way, Schweizer pauses. "Not really," she says. "I didn't get this feeling. Sometimes yes, of course. There were machos everywhere at that time, it was normal, but it never bothered me. I was very lucky — all the musicians I played with always had a certain respect for what I did." Though she does add: "I would be much better known if I was a guy." 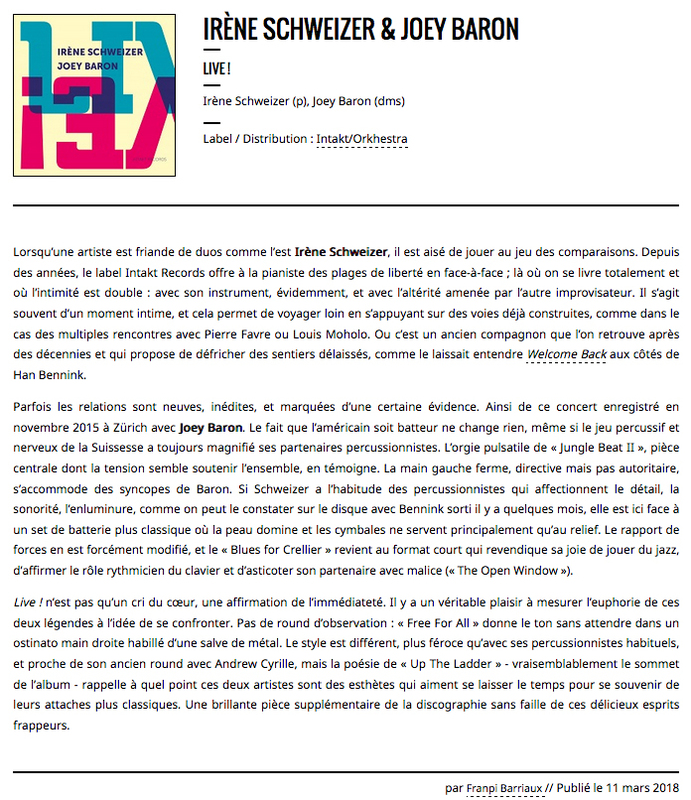 Louis Moholo, Han Bennink, Pierre Favre oder Andrew Cyrille sind ausreichend dokumentiert. 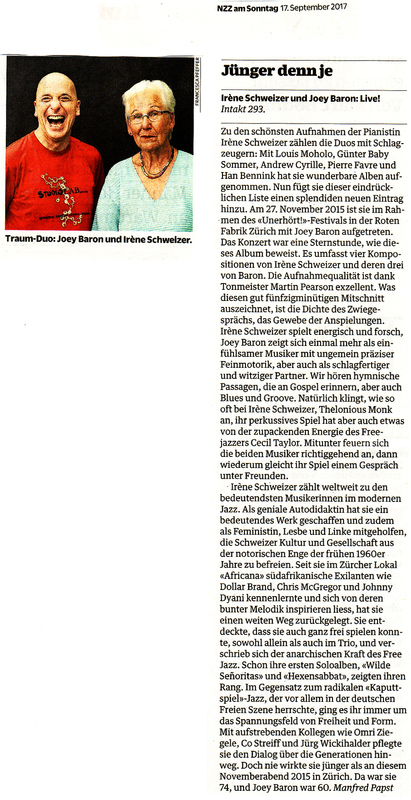 Jetzt hat sie in der Zürcher Roten Fabrik ein weiteres Duo mit dem grandiosen Joey Baron aufgenommen. Es sind allerdings keine freien Improvisationen, sondern Stücke, richtige Kompositionen, vier von Schweizer, drei von Baron, die die Basis für nonkonformistischen Austausch bilden. John Corbett schreibt in den liner notes von "Schatten und Doppelungen", die dem Duo innewohnen. Da ist schon was dran, vor allem wenn es um Schlagwerk und Klavier geht. Der Rollentausch zwischen Rhythmus und Melodie, vom Piano zur Perkussion und wieder zurück, das Aufeinanderzugehen, das Voneinanderwegbewegen, das Liebesgeflüster und die stürmische Debatte sind da zentrale Bestandteile. Und wenn so exemplarisch vorgeführt wie auf dem vorliegenden Tonträger von Schweizer und Baron, ein exorbitantes Hörvergnügen. 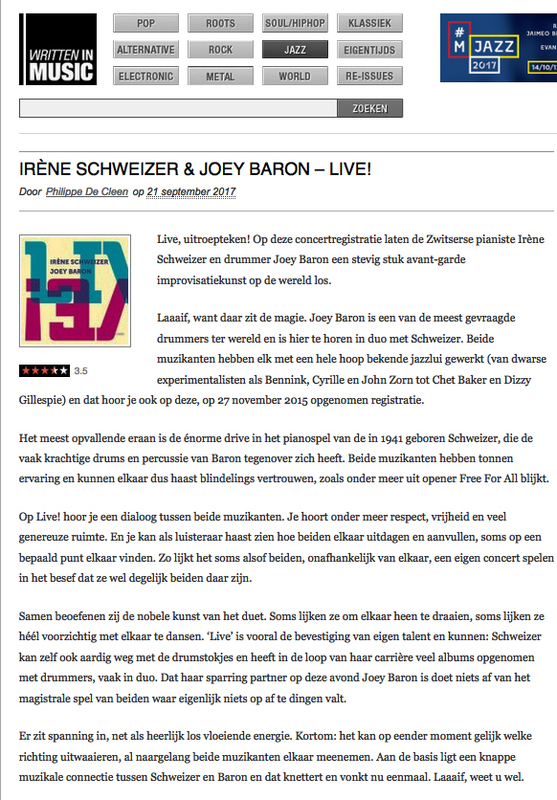 JOEY BARON hat bei den Drummerdates von IRÈNE SCHWEIZER noch gefehlt. Nach Live! 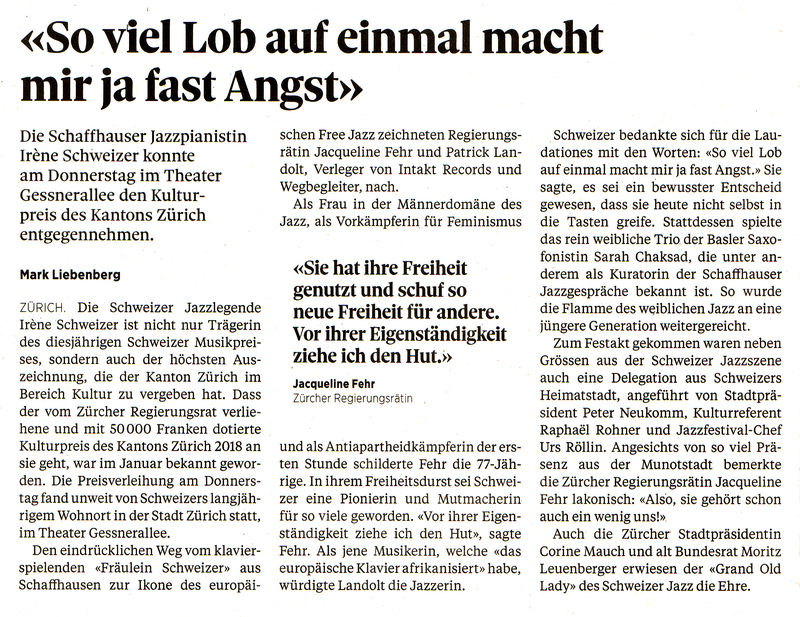 (Intakt CD 293), ihrem Auftritt beim Unerhört!-Festival in der Roten Fabrik Zürich (27.11.2015), kann sie das Trikot (eine Locke ;-) des New Yorkers nun neben denen von Bennink, Cyrille, Favre, Moholo und Sommer heften. Indem sie mit ihm 'Free for All' anstimmt, knüpft sie direkt an das Wiedersehen mit Bennink im August '15 an. 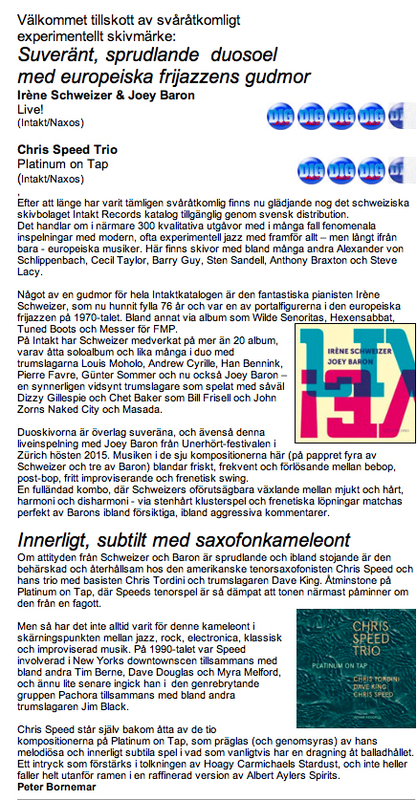 'Jungle Beat II' ist Glied einer Reihe, die von Cape Jazz-Reminiszenzen gespeist scheint (siehe, pardon, höre: ihr Solo "To Whom It May Concern" 2011). 'Blues for Crelier' (als Ohrwürmchen für ihre Freundin Monique Crelier) spielte sie auch schon 2013 mit Favre. Drei Ideen steuert der um 14 Jah­re jüngere, aber bei annähernd 300 Einspielungen mit allen Wassern gewaschene 'Killer Joey' bei. Und hat der nicht mit Carmen McRae, Akiyoshi & Tabackin oder Toots Thiele­mans in the tradition angefangen, bevor er sich in New York unverzichtbar machte und sein Ticket in die Unvergesslichkeit löste mit Naked City, Masada, Electric Masada, über­haupt allem Zornigen und dazu als inzwischen kahler Drummer Boy bei Uri Caine oder John Abercrombie? Wie nur wenigen - neben John Zorn selber - liegt ihm das Zarteste ebenso wie Nova-Explosivität und der Dienst als schwer gerüsteter Templer. Barons Spiel mit Schweizer lässt John Corbett über ein Eigenleben von Schatten phantasieren. Man kennt das als Doppelgängermotiv der Schwarzen Romantik und durch Chamissos Peter Schlemihl. Wie fabelhaft es ist, wenn die Folge der Ursache spottet, wenn ein Korollar sich untrivial gebärdet. So wie hier. Und das im Plural: Tänzerisch beschwingte Gesten und Wechselschritte, polternder Schlaghagel, Glasperlenspiele und torkelndes Fingerspiel, Mad Movie-launige Kapriolen, steppende Clownsschlappen, agile Ur- und Übersprünge, lähmende Fieberhitze, die die Klänge halluzinatorisch dehnt, Dschungeltrubel, der sie animiert. Das Eliptische, Dialogische vermehrt sich noch, wenn die rechten den linken Händen ins Wort fallen, wenn das Samstägliche mit bluesig Beschwingtem korrespondiert. Und fliegt in der finger- und stöckchenspitz kapriziösen Encore durchs offene Fenster. 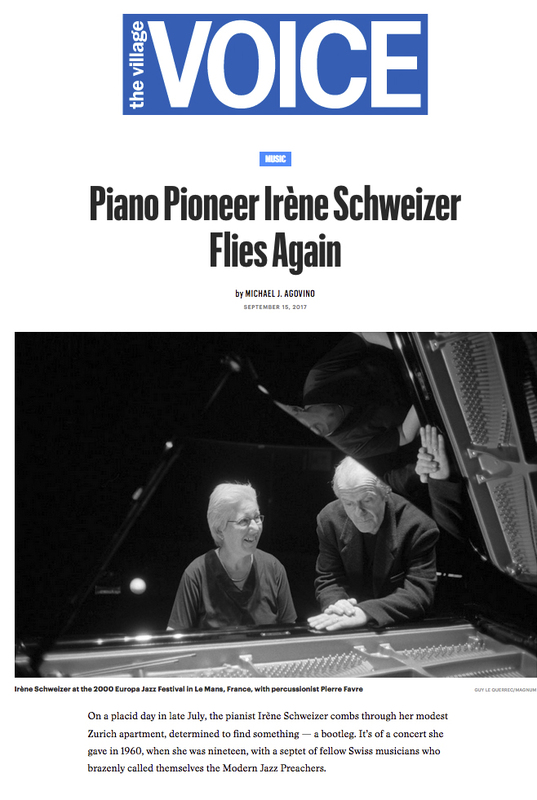 Sono passati trentuno anni da quando la favolosa pianista svizzera Irène Schweizer iniziò a documentare per l’etichetta svizzera Intakt i suoi duetti con batteristi. Spesso ripetuti nel corso degli anni. Iniziò con Louis Moholo, principe libero della poliritmie sudafricane, proseguì con Günter “Baby” Sommer, Andrew Cyrille, Pierre Favre, Han Bennink. 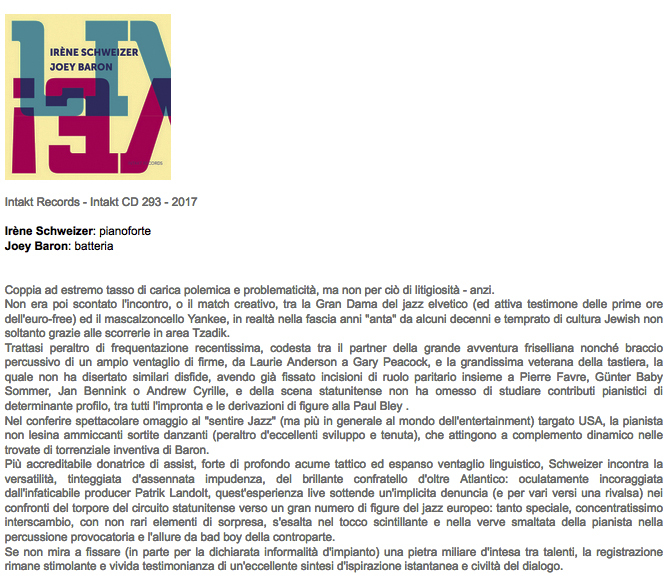 Dunque bel bilanciamento tra protagonisti delle note afroamericane ed esponenti della stessa famiglia di note europei, spesso suoi compagni d’avventura in territori dove la musica si liberò da molte pastoie formali, negli anni Sessanta e Settanta dello scorso secolo. 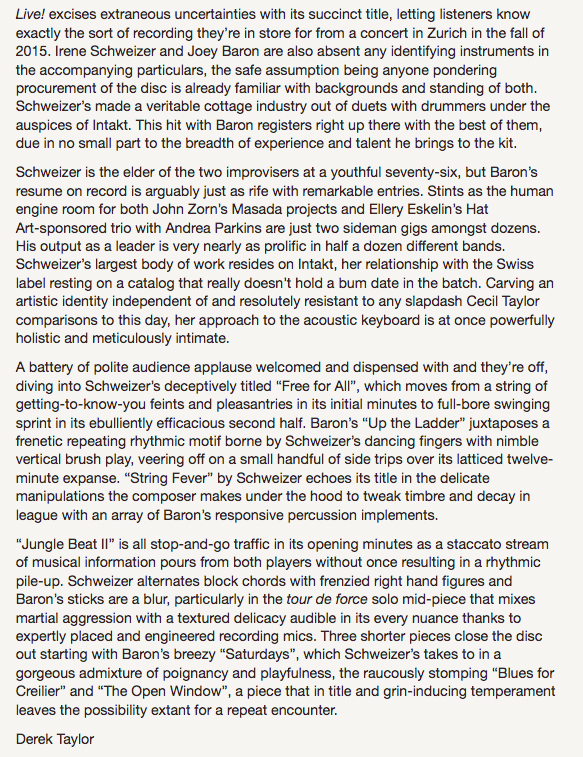 Adesso Schweizer torna a guardare all’America, e incrocia le energie con Joey Baron, una delle menti più brillanti ed efficaci emerse nel campo delle percussioni negli ultimi decenni: batterista capace di suonare con gesto dinoccolato e aperto, salvo poi saper tornare in una frazione di secondo a groove micidiali ed implacabili. Non ingannino gli aspetti, né le parole sembrino offensive: Schweizer oggi ha l’aspetto rassicurante da nonna buona, Baron sembra il proprietario di un emporio in Texas. Assieme, invece, sono pura intelligenza jazzistica in azione, mercuriale e imprevedibile a dispetto di ogni anagrafe possibile o reale. Che dichiara settantasei anni per lei, sessantadue per lui. Si sono trovati sul palco di un Festival il 27 novembre del 2015, a Zurigo, e questo cd è cronaca fedele e impressionante della potenza sprigionata dall’incontro. Nell’iniziale “Free For All” al terzo minuto Schweizer si inventa un pedale su una nota sola che lancia un memorabile canto in odore di blues e di gospel, in “Saturdays”, a firma di Baron, vince una linea melodica di bellezza scultorea, in “String Fever” la cordiera del piano è percussione aggiunta a quelle di Baron. Certi incontri lasciano il segno. Questo resterà.